I have a background in education. One of the things that frustrated me most as a teacher was when I encountered families who had received bad advice from other teachers. This shouldn't be all that surprising though. Teachers today are burdened with unrealistic expectations from administration and the state, not to mention standards that change more rapidly than a growing toddler. I am not a medical professional, so I don't presume to know better than my pediatrician. However, if the field of healthcare is anything like teaching, then it's possible that the everyday demands of the job may prevent some doctors from keeping up to date with current research and AAP recommendations. This is why I think it's important for parents to do their research (which is not the same as one Google search) when it comes to making decisions about the health of their child. In this post I'll provide a few links to get you started, but please understand that I am not an expert and there is a lot more information out there! The American Academy of Pediatrics currently recommends that parents introduce solid foods into their baby's diet when s/he is about 6 months old. On their website they remind parents that "babies who start eating solid food too early are more lilkely to be overweight or obese in childhood and adulthood." They also recommend introducing a variety of tastes and textures and encouraging self-feeding early on. 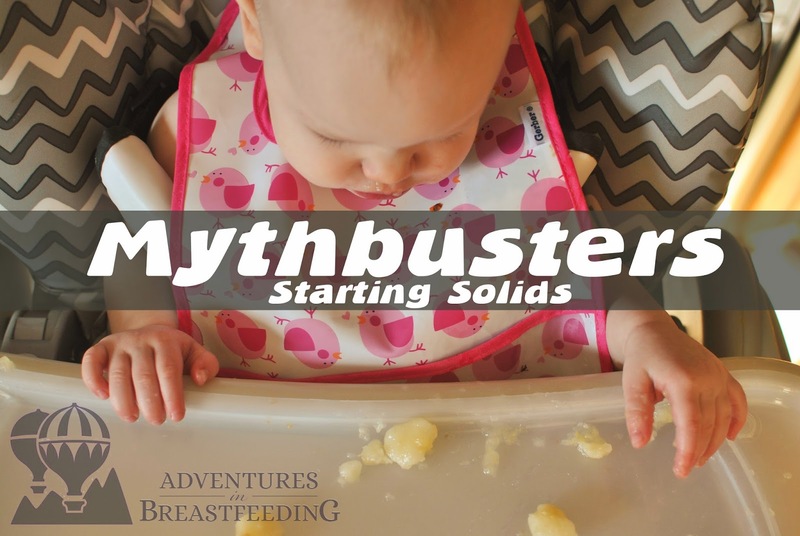 In spite of the AAP's efforts to communicate these current guidelines, there are a few pervasive myths out there regarding baby's first solid foods. Myth #1: My baby is hungry and breast milk isn't enough. Evidence shows: Breast milk contains all nutrients baby needs up until 6 months. The AAP states time and again that breast milk is the best source of nutrition for babies up until they are one year old. At around 6 months when baby's iron stores begin to dwindle, introducing solid foods rich in iron is a great way to supplement his nutritional needs. But a baby's need for iron may be impacted by factors like birth weight, gestational age at birth, etc. So if you have a healthy, typical baby who isn't a huge fan of solid foods at 6 months, keep offering those solids, but keep offering the breast as well. It's likely that she will come around when she is ready without her health suffering. There are some periods of time early in baby's life when he may be going through growth spurts and doing lots of cluster feeding. Frequent feeding is not necessarily a sign that baby isn't getting enough. If you are concerned, see an IBCLC to do a weighed feed (do not rely on pump output to tell you how many ounces baby is consuming!) and ask for advice. 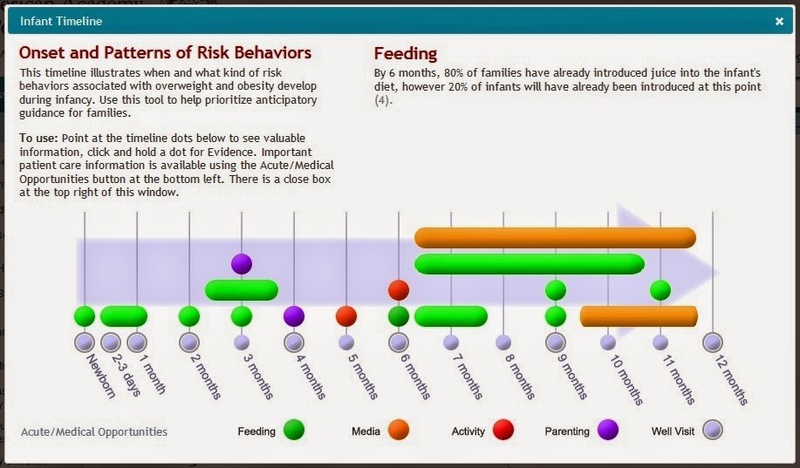 This timeline of a breastfed baby has some excellent guidance to help you know what is "normal" as baby grows and develops. Myth #2: My baby needs solid food to sleep through the night. Evidence shows: There isn't a link between feeding baby solids and longer stretches of sleep at night. One study specifically found that rice cereal feedings before bedtime had no discernible impact on infant sleep duration at night. In fact, research has shown that introducing solids too early may make your baby sleep less! Dr. Gold, a pediatrician in Brooklyn, told the New York Times that infant sleep often has less to do with hunger and more to do with learning how to sleep. 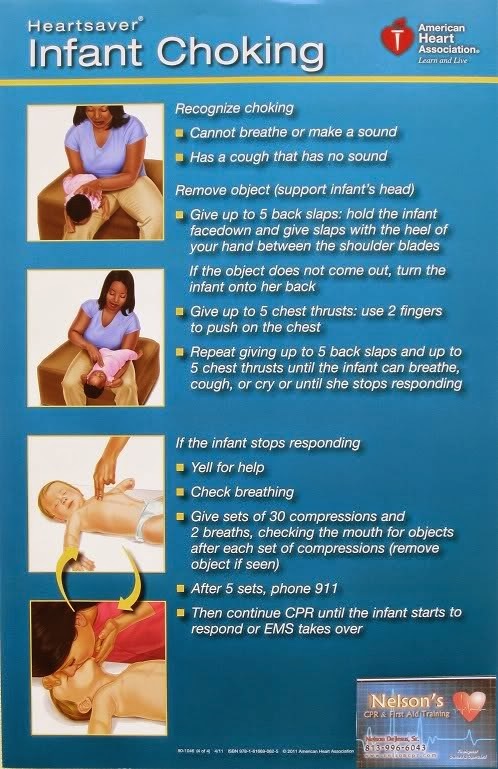 If you're a haggard mommy zombie who's desperate for some infant sleep guidance, try reading this or this. Myth #3: My baby can only eat bland purees at 6 months. Evidence shows: Different babies prefer different kinds of food. Age-old solids introduction probably looked like a mix of purees and finger foods. Baby-led weaning (BLW) is on the rise today with more parents introducing their baby to solid finger foods before first using purees. Skeptics of BLW are often leery of choking episodes. 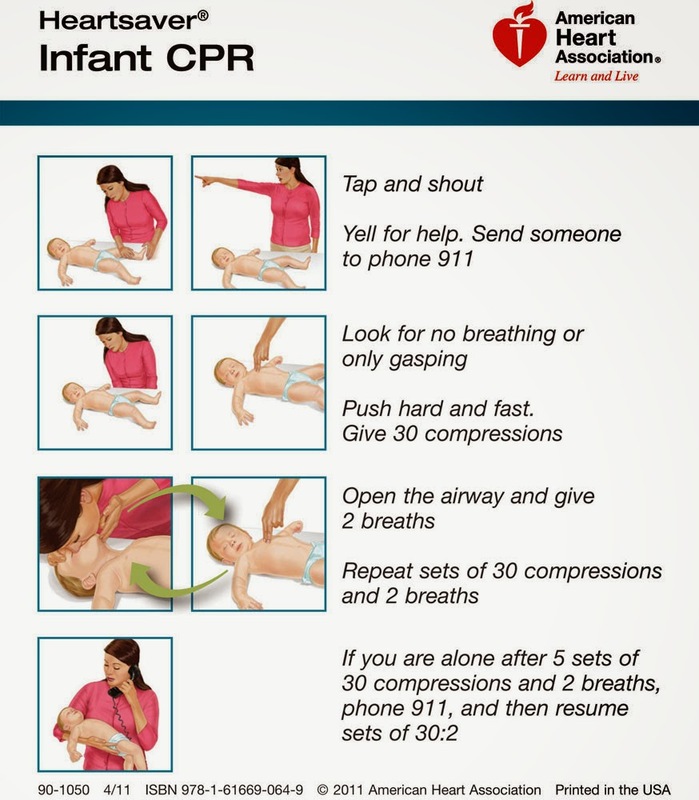 Whether you choose to do BLW or not, be sure to look up procedures for infant choking. I keep the picture below on my phone, desktop, and have a printout close by for ease of mind. The point is, babies love exploring new foods and textures. It can take up to 10-15 tries before a baby will accept a new food, so if she refuses, offer again a few days later, and repeat! Myth #4: Delaying solids can lead to [insert malady here]. Evidence shows: Evidence shows: Delaying solids until at least 6 months benefits mom and baby. Not all babies are ready to eat solid food at 6 months. 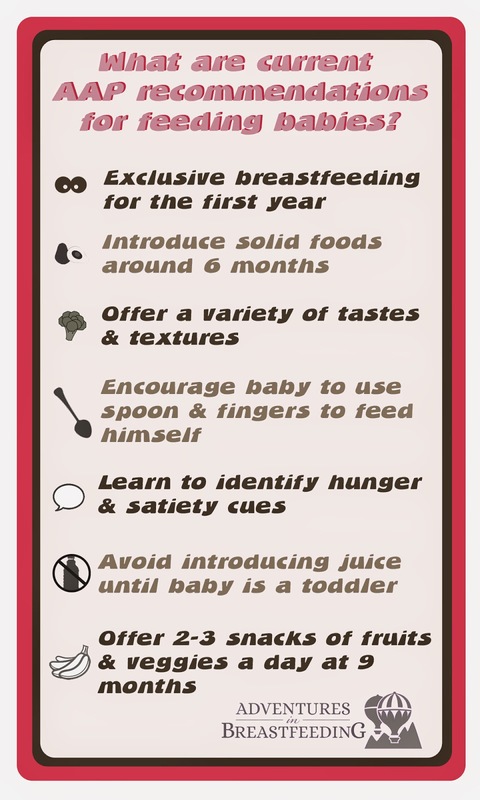 More moms today are realizing that delaying the introduction of solids until at least 6 months has many benefits. What confuses many parents in US black-and-white culture is that guidelines are not intended to be hard and fast rules because every baby is the same, but at the same time marvelously different. We introduced solids to my daughter at 6 months, but she did not really become interested in eating any of them until closer to 10 months. During this time I had moments when I worried, but I tried to remind myself that she was developing at her own pace. Now she is 13 months old and healthy as she's ever been. She attacks broccoli, enchiladas, and blueberries with great gusto and it's rare that she refuses a particular food. Some are concerned that a baby's delayed interest in solids could lead to speech and fine motor delays. This speech and language pathologist shares her take on BLW and how it has some overlap with an SLP's perspective on feeding. Like I said before, do some research. If you find some method or philosophy that resonates with you, keep reading! Don't limit your explorations to only reading studies, blogs, and articles that agree with you. As you widen your search and learn about feeding (or parenting in general!) you will learn to differentiate between people who are experts and those who are blowing smoke, and you will ultimately learn to trust yourself. What is the best advice you've heard about starting solids? What's the worst?